We’v all been there. We throw a party, put out a veggie platter, and then find that many of the veggies got left behind. So then there is this mixed bag of “finger food” veggies that sits in the fridge, waiting for you to pull out some dip and pack everything for lunch for the next several days. Well, I got tired of that whole scenario. So when I had a bunch of mixed veggies left over from Mini Chef’s birthday party, I got in the kitchen and got to work. The truth is, you can use any type of veggies in this with any amount of stock or broth. So make this work for what you have on hand. It’s very versatile and will accommodate just about any adaptation you can throw at it. Have fun with it! In a large zipper top bag, combine the veggies, oil and dry spices, EXCEPT for the bay leaf. Shake well to coat the veggies evenly. Pour them out onto a baking sheet and bake for about 40 minutes or until they are mostly cooked. The carrots will take the longest. 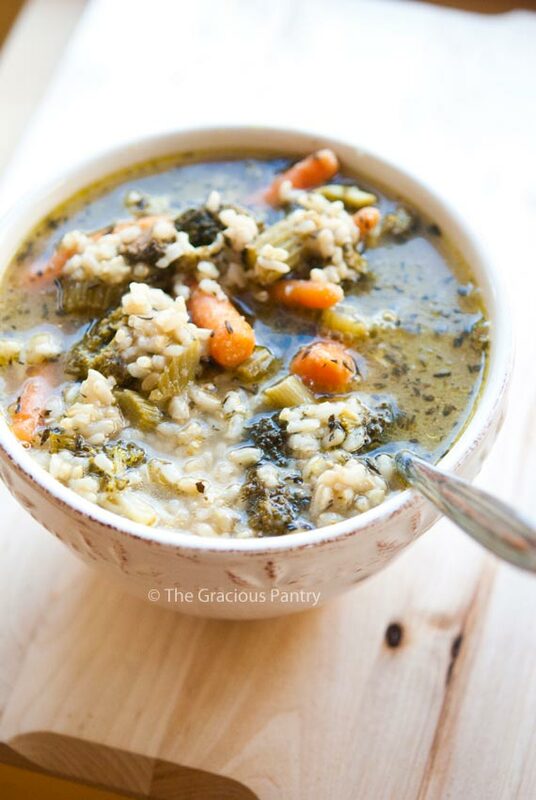 Pour the stock into a large pot, add the bay leaf, roasted veggies, and brown rice. Bring to a boil, reduce to a strong simmer and cook for about 10-15 minutes to allow the flavors to really come out into the soup. Remove and discard the bay leaf. Serve the soup, top with parmesan and season with salt and pepper as needed. Number of servings (yield): Amount will vary. Nancy – I would just make sure you have enough to cover the veggies plus some extra for what will cook down as you cook the soup. It’s pretty open. I made this with vegetarian broth and really roasted the vegetables so they were nice and browned, because I was making it for a variety of people with dietary restrictions, including vegans and people with allergies to a variety of things. One person couldn’t eat brown rice because of digestive issues, so I put in potatoes instead. It was fabulous! Nobody felt like they were missing something and yet it fit everbody’s diet! Thanks for the idea of roasting the vegetables and thanks for a recipe that fits all of us who like to get together with people who have food issues!